Long gone are the days when–in an average week–we went out to dinner 4 or 5 times. As food editor of Seattle magazine and editor the Seattle Zagat guide, I had to keep up on every new opening, restaurant trends, what all the hot chefs were up to. Now I relish being in another phase, cooking at home most nights and appreciating the meals out a bit more. Dinners at home are usually unscripted, wing-it affairs, based on whatever grabbed my attention in the grocery aisles. One such example, this week’s braised sausage with lentils. Just a handful of ingredients, limited active time at the stove and delicious results. Start with top-quality sausage, 4 to 6 ideal. My grocery store’s meat counter has Uli’s sausages in the case, I picked up bratwurst this week. 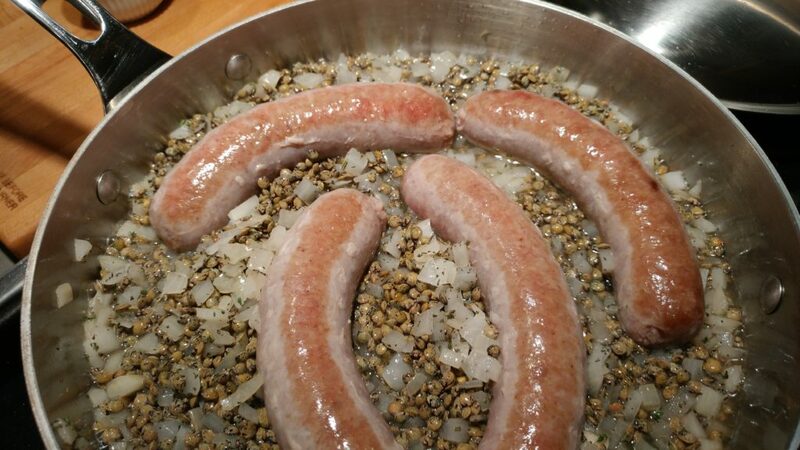 A raw sausage will be best for this recipe; if you buy a precooked sausage, tweak the recipe a bit by nixing the browning of the sausage and cooking the lentils solo for 20 minutes or so, adding the sausages to warm through as lentils finish cooking. Before getting too far, preheat the oven to 350F. Heat a large skillet or saute pan with a bit of oil and brown the sausages over medium heat for a few minutes on each side. Set them aside on a plate and add 1/2 onion that’s been minced, along with a clove or two of minced garlic. Saute until tender and aromatic. Add a tablespoon or two of minced fresh herbs, I used thyme and rosemary. Dried herbs will fine, but use just a teaspoon or two in that case. Oh, and of course a good pinch of salt and few grindings of black pepper. Stir for a minute or two until well blended, then stir in a generous cup or so of lentils. I’m a big fan of green lentils, they hold their shape very well when cooked and have great flavor. No more to it! 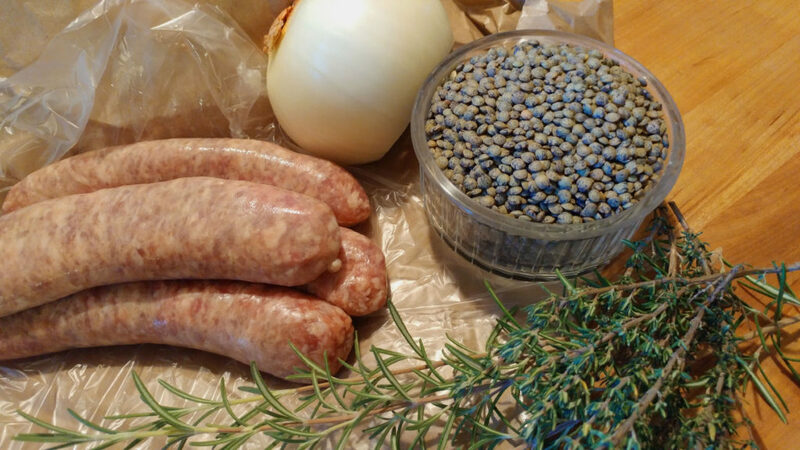 If, like me, you tend to have things like lentils and onion on hand most of the time, only thing to pick up is some sausage. With just a few minutes of active time, it’s a simple, satisfying dinner for any night of the week.